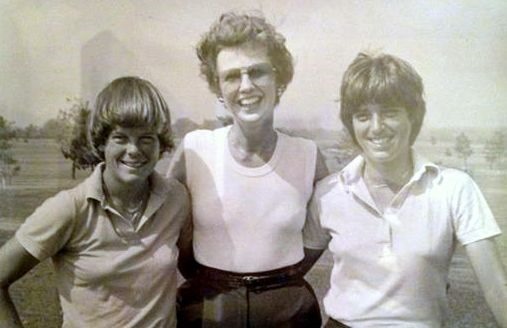 This is for all you LPGA old-timers out there. You may get the bookends but who’s that in the middle? This entry was posted on Monday, July 15th, 2013 at 5:39 pm and is filed under Uncategorized. You can follow any responses to this entry through the RSS 2.0 feed. You can leave a response, or trackback from your own site. 11 Responses to Guess Who? Smich man : Is that Washam and in the middle Sandy Wheeler with state farm? I’d recognize Sandy Wheeler anywhere! Now you didn’t put this comment in here did you? You must have taught your seeing eye dog how to type. Oh yea old timer !!! How about that backdrop. No jail at The Rail! Machine how did the operation go? sandy wheeler retired from the money she never used to feed caddies!! Also from NEVER giving out even one extra weekly pass! She almost went broke from paying Becky Larson’s official money check one year.